Now that some of the fatigue has worn off from last week’s INBOUND Conference in Boston and I’ve had a little time to process everything, some of the most important realizations from the event are bubbling to the top. And what’s surprising me most of all is that the things I took away from the event are both nothing new and nothing short of revolutionary at the same time. First: What Is INBOUND and Why Should You Care? …whom we may or may not have booked for an upcoming episode of our podcast, but who has written some incredibly impactful books like A Whole New Mind: Why Right-Brainers Will Rule The Future, the hugely important Drive: The Surprising Truth About What Motivates Us and his latest: To Sell Is Human (which I have yet to read). Other big names included Seth Godin (whose keynote was held in a tiny room that filled up early), actor & comic Aziz Ansari, podcaster Marc Maron, and Co-Founder of Buzzfeed, Jonah Peretti. Second: Why Is Everyone Referring to This Stuff as “Inbound” Marketing? But exactly what has replaced the old ways? This is where you’ll hear lots of different ideas. … is it Social Media? Perhaps… but your Facebook Page reach is probably as bad as everyone else’s. …is it Blogging? Sure… you should be doing that. But even if you get great Google rankings and lots of subscribers, we both know that those things don’t make the proverbial cash register ring. Well… the truth of the matter is that something more holistic, more strategic, and more cohesive is probably the most effective way to answer this question. For years now, I’ve been using the term “content marketing,” because I like the simplicity of it. You put out “bait” that your future customers are hungry for… and you lead them on a trail right to your door. Naturally, the simplicity of the term belies the complexity of the actual execution… but that’s the way these things go. But perhaps the arguably broader term “inbound” has an even more deceptive and seductive simplicity. I might adopt it, because it does a better job of implying just how backwards this approach is compared to the old ways. The idea is simple: you attract customers to you… and the arrive like flights coming into O’Hare… rather than you seeking them out, which is what the old, expensive, and ineffective methods amounted to. I also like the term “inbound marketing” for another important reason: it explicitly describes the ultimate goal of all these efforts: actually generating leads. Third: So What Did You Learn That Was So Shocking? It’s simple really. 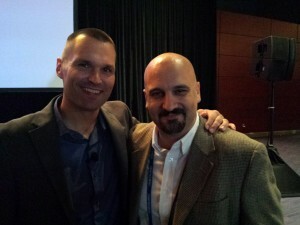 I learned that we aren’t “all in” on inbound marketing. And by “we” I mean me, since I’m the one leading my team. If you know me (even a little), you probably know that we’ve built our business around these ideas. Since 2006, we’ve been training customers to create fresh content for the web, make low-risk offers that generate subscriptions, use automated follow-up via email, and ultimately drive those customers to irresistible offers that create revenue. …in other words, the very essence of the essential elements of inbound marketing. 9 years is a long time. How could it be that we aren’t “all in” on it yet? 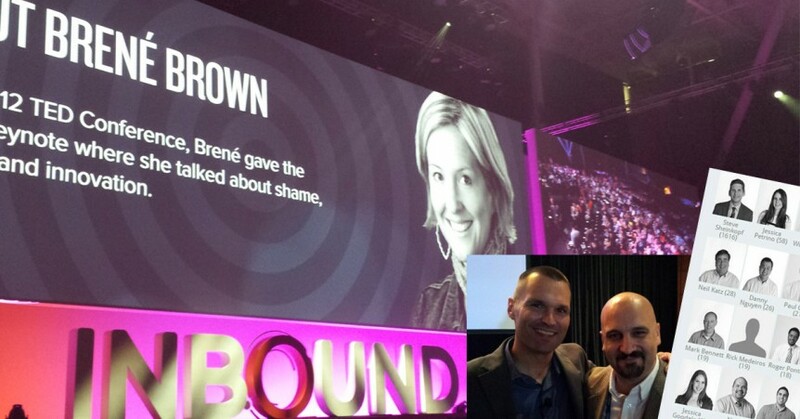 But that was the most shocking revelation for me at #INBOUND15 last week. I’m not really committed to it. Since saving his own business from the brink of disaster, Marcus has been helping other companies adopt the methodologies of inbound marketing… and with fantastic success. I’ll admit that I primarily attended his session just to shake hands and meet in person, since we’d only ever met via Twitter, email, and our podcast. Sure… I was expecting to get some juicy nuggets that would be valuable, but in no way did I expect him to give me the “come to Jesus” moment that I got. The #1 problem facing this industry today is a lack of buy-in from top leadership. OK… I get that. I’ve seen it, too. The owners & top leaders within some of our clients don’t get it either. But that’s when the sucker punch came. The longer Marcus spent sharing about what this lack of “buy-in” really looks like, the more I began to recognize myself. Marcus told the story of Yale Appliance, a major retailer in the Boston area. Some years ago, they adopted blogging and other elements of content marketing. After one full year, their website traffic had grown, but not by a whole lot. But that’s not going to get it done. Instead, it needs to become a culture. When it’s a “religion,” it doesn’t just happen when someone gets around to it or when they feel inspired. And it doesn’t get “phoned in” or otherwise executed half-heartedly. It gets treated as the high-priority requirement that it really should be. 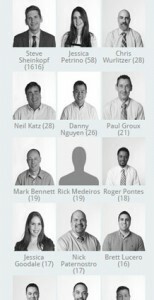 You can see the evidence of this on the Yale Appliance blog (pictured at the right), where the staff are ranked according to how many pieces of content they’ve contributed to. Sure… and the volume of content they were creating went up, which meant the frequency was increased. It’s easy to see why that would help, right? But those are not the biggest factors in the success of their inbound marketing efforts. What is the biggest factor? The nature of the content changed. Your content is the soul of your business. What do you think happens to your content when it’s being produced by front line staff? You know… the people who actually spend the majority of their time with the customers? In the case of an appliance business, I’m sure that means service technicians, sales associates, dispatchers and customer service representatives. What happens is that your content gets a lot less fluffy and a lot more real. 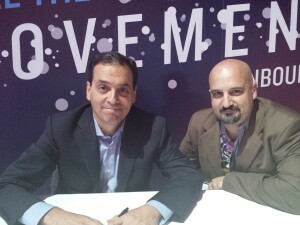 If you as a business will allow it to happen, the content will get a lot gutsier. But when he shared the story of what Yale Appliance did, it took things to a whole new level of gutsy. In one blog post that Marcus cited, Steve Sheinkopf of Yale Appliance listed the major brands of products they sell and ranked them based upon actual service call data for 1 year according to which brands resulted in the fewest service calls! 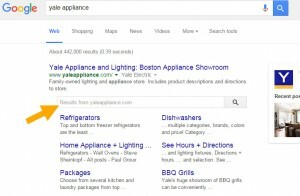 I can only imagine the phone calls from the manufacturers’ reps after that one got published… especially since Yale Appliance’s blog is atop the search engine results for any number of searches! When Google offers visitors a chance to search within your site… it means you have a lot of content. Today, this retailer based in Boston sees more than 400,000 visitors arriving at its website each month. They’re “all in.” And most importantly: they have measured the impact on their sales and their bottom line. But this post is already longer than I planned to write. Suffice it to say that we—my team and I—are taking a hard look at our own approach, and we’re going to be expecting our clients to go “all in” with us. Seeing the amazing results that some of them have already achieved, I can’t tell you how excited I am to see where this will take them in the future! 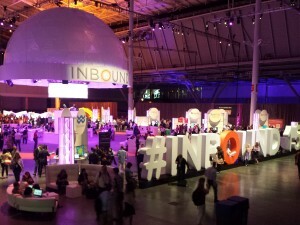 For more key takeaways from INBOUND15, listen to this week’s episode of our podcast. What Metrics Should You Use to Evaluate Your Lead Magnets?